Chronic otitis media (COM) is a chronic infection of the middle ear cavity. It is caused by an ongoing inflammatory response within the middle ear (with granulation), and is typically associated with unresolved and resistant bacterial infections. Around 0.9% of children and 0.5% of adults have chronic otitis media – and approximately half will develop an associated hearing impairment. In this article, we shall look at the risk factors, clinical features and management of chronic otitis media. Recurrent AOM is the most common cause of COM. Other associated risk factors include traumatic perforation of the TM, insertion of grommets, and craniofacial abnormalities. Patients will present with a chronically discharging ear (for >6 weeks), in the absence of fever or otalgia. If fever or pain is present then other diagnoses should be considered, such as otitis externa, mastoiditis or intracranial involvement. 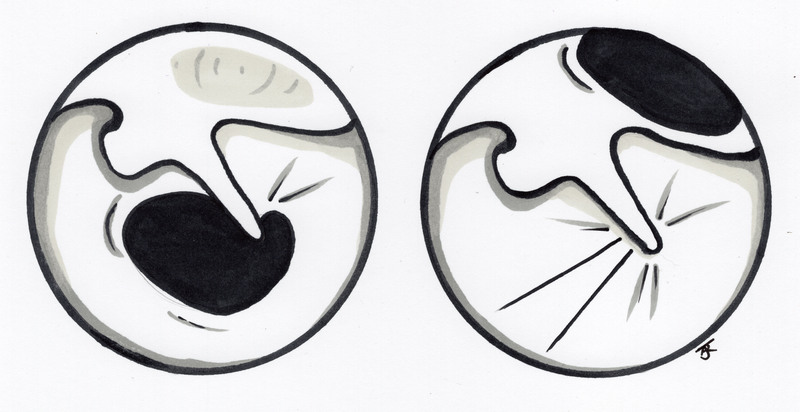 On examination, the tympanic membrane will be perforated (Fig. 2); it is important to note the location of the perforation due to the potential risk for cholesteatoma formation. 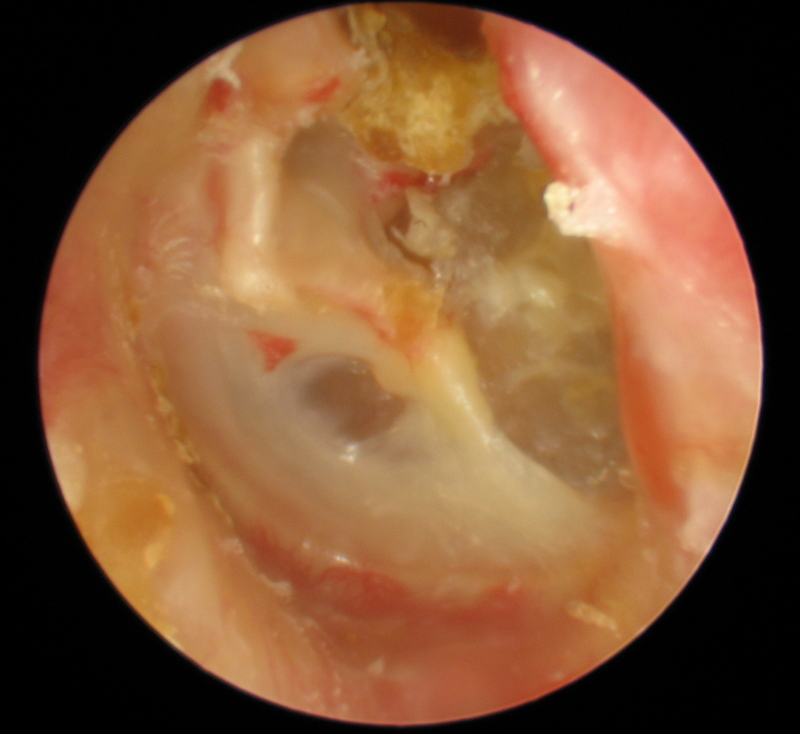 Patients will often have a history of recurrent AOM, previous ear surgery or trauma to the ear. Audiograms and tympanometry should be performed, although this is not possible in a heavily discharging ear. Swabs can be useful in cases of treatment failure. 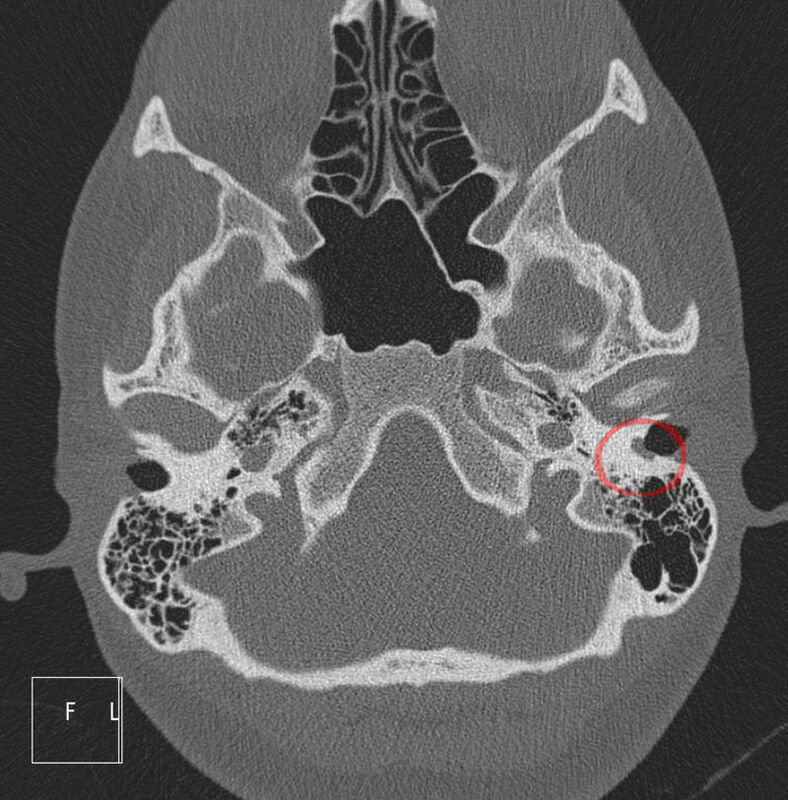 Whilst the diagnosis of COM is made clinically, any suspicion of cholesteatoma warrants a CT scan of the petrous temporal bone for further assessment. The mainstay of treatment is aural toileting and topical antibiotic/steroid treatments until symptoms reduce or resolve. Any suspected cholesteatoma should be urgently investigated further. Patients with symptoms lasting >6 weeks or those with large amounts of debris should be seen by an ENT specialist. The patient should be counselled on the importance of keeping the ear clean and dry. Most TM perforations will heal spontaneously however large perforations may persist and referral for potential surgical management may be required. Surgical treatment options are available but the success rate of surgical repair is dependent on the size and site of the perforation. The aim of closing a perforation is to relieve symptoms of persistent discharge and prevent recurrent infection. The closure is achieved by patching on an autologous graft, usually harvested from the tragal cartilage or temporalis fascia. If the external ear canal and drum are normal, with normal pneumatic speculum, pain is not from ear disease but instead referred pain. A cholesteatoma refers to a pocket of ectopic epithelium which grows in the attic of the middle ear. In this condition, epithelial cells naturally shed within this pocket but cannot escape the middle ear and so the collection grows (Fig. 3). to form in the attic. This abnormal migration of squamous epithelium in turn leads to cell debris building-up and the forming of a cholesteatoma. It has no metastatic potential but can potentially have devastating locally destructive effects if left untreated. They grow independently and can affect the bones of middle ear, facial nerve, inner ear, and skull base. Patients will present with conductive hearing loss, on a background of COM. Congenital cholesteatoma are rare and difficult to detect. Diagnosis is made clinically during examination whereby a pearly, keratinized, or waxy mass in the attic region is seen (Fig. 4). These are best seen when a perforation of the TM is present, providing a window into the middle ear. A CT scan (Fig. 5) is arranged pre operatively for surgical planning and guide clinical suspicion. Definitive management of a cholesteatoma will be surgery, aiming to remove the entire cholesteatoma or it will recur. Most surgical approaches involve creating a ‘mastoid cavity’, whereby the cholesteatoma is removed and the mastoid ‘cleaned out’ by drilling away the air cells. Access to the mastoid is traditionally made using a post-auricular or pre-auricular incision (although increasingly can be accessed endoscopically). The ossicles can be reconstructed depending on the damage caused by the cholesteatoma. The aim of surgery is not to restore hearing but to halt progression of the destructive lesion and create a ‘safe and dry ear’. 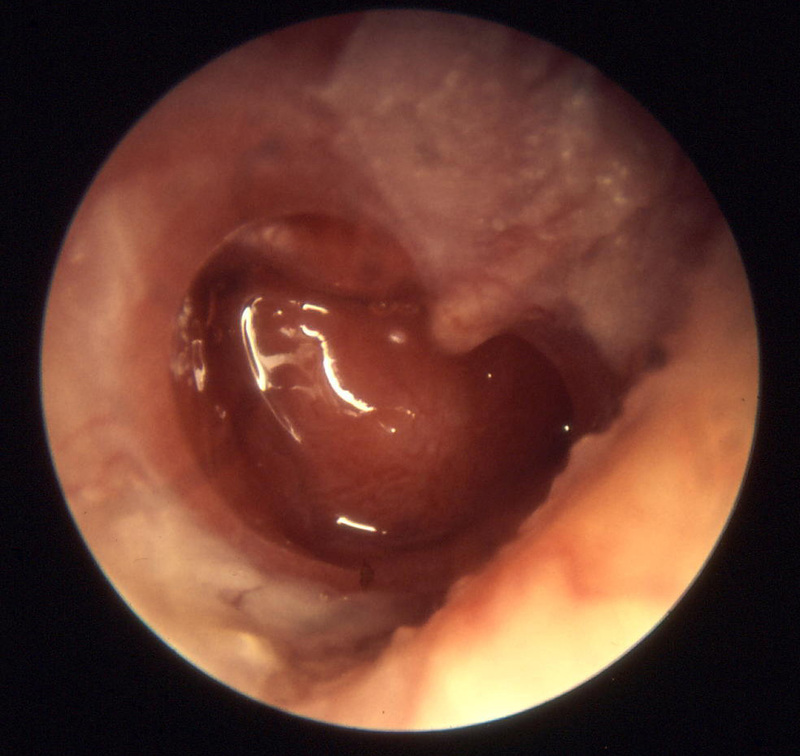 Perforations in which part of the tympanic membrane are deemed as 'safe' due to their low risk of forming cholesteatoma? Which Cranial Nerve is the function most important to test for in cases of COM? Which imaging modality is most useful in the pre-operative assessment of a cholesteatoma?